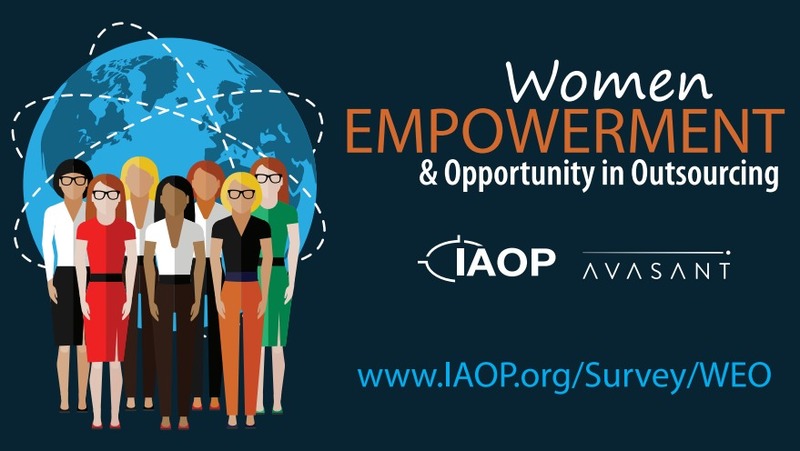 WINDERMERE, Fla. - May 26, 2016 - PRLog -- IAOP, in collaboration with Avasant-a global management consulting firm-announced today, the launch of its Women Empowerment and Opportunity in Outsourcing survey. The purpose of the survey is to gather data on the perceptions of gender equality, empowerment and opportunities for women in the outsourcing industry and identify where and how outsourcing has internationally empowered the lives of women, both inside and outside the workplace. "Women play a vital role in both society and the workforce, and we have reached a significant moment in a growing international movement toward women's equality and opportunity," said Dana Corbett, IAOP Director, Research, Training & Certification. "We are proud to be joining this global movement in recognizing and valuing all women fairly, as their effective empowerment is a clear catalyst for progress." Findings from this survey will be presented in a powerful main session during OWS17 (http://www.iaop.org/Summit), in February 2017. Participants receive a copy of the results as well as entry into a drawing for seats to OWS17, by submitting an e-mail request at the end of the survey. "The outsourcing industry has historically had an underrepresentation of women in executive and delivery positions," said Kevin Parikh, Global CEO, Avasant. "At Avasant, we have adopted a hiring strategy to equalize this imbalance. We are thrilled to support IAOP's WE initiative as a collaborative project partner, a board member and advocate for gender equality." The survey is open to all of IAOP's global members and affiliates, Avasant's clients, and all outsourcing professionals across the field and around the world. Though this survey topic is focused specifically on women, everyone is encouraged to participate. You can access the survey here (http://www.iaop.org/survey/WEO). IAOP is the global association that brings together customers, providers, and advisors in a collaborative, knowledge-based environment that promotes professional and organizational development, recognition, certification and excellence to improve business service models and outcomes. Visit www.IAOP.org (http://www.iaop.org/).